Makes sharpening your chainsaw much easier and more precise. 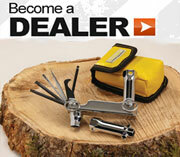 The Timberline Chainsaw Sharpener lets you sharpen your chain on the job. Allowing you to work faster, smarter. The tool comes with everything you need to sharpen your saw. Durable carry case with shoulder strap and belt loop included. One carbide cutter included. Additional carbide cutters are interchangeable and may be purchased separately. Note, 5/32 included.